With my husband and son, as well as camera, camcorder, cassette recorder, and laptop loaded in the van, off we went to meet, for the first time, my Dad’s Uncle James in Virginia in August, 1996. The drive would take fully a day and a half. I was both nervous and excited, having never done anything like this before. I was about to meet family I had known about for years, but had never met. 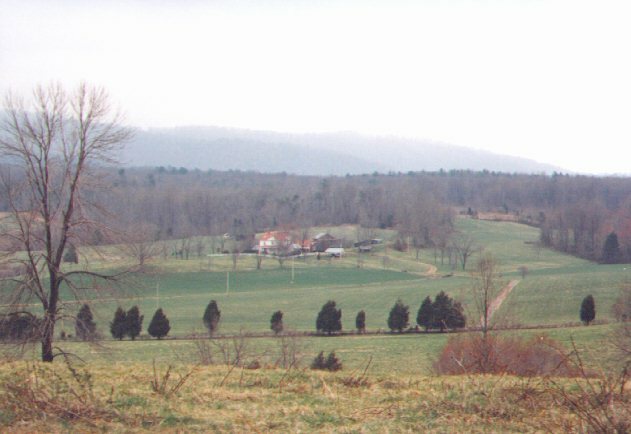 Once we arrived in Charlottesville, Va. and headed north through Madison, Va., it would only be about thirty minutes until we arrived at “the farm,” which is in the area near Novum and Haywood, Va. What an amazing drive it was through the countryside. The rolling hills and winding roads through the foothills just east of the Shenandoah National Park is breathtaking. The farm land, old homes, churches, barns, sweeping valleys, and the mountains simply grabbed my heart. And I started to feel more and more at home the closer we got. We actually found the place without getting lost, which is saying something. Approaching the driveway we slowed, which gave me my first glance of my family homestead. The site was far, far more than I had ever imagined. 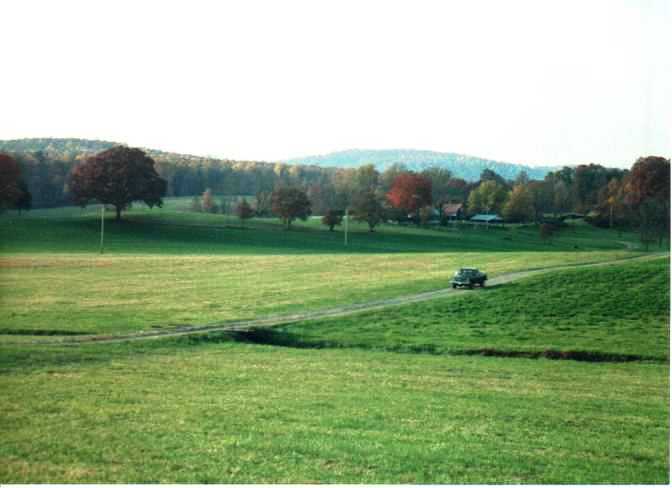 The drive from the main road up to the house is probably near a half mile long (or at least seems that far) and crosses a small creek, with the house nestled among gently rolling farmland. Uncle James would tell me later that this land produced the best corn in the entire State of Virginia at one time. Here is “the farm” from near the main road. As we pulled up in front of the house, the door in the breezeway opened, and out came this rather spry older gentleman with his arms raised and a huge smile on his face. I climbed down out of the van, and walking toward him I said “Uncle James?,” and he laughingly replied, “well, who else would I be? !” He came to me with open arms, gave me a the biggest bear hug, and said, “It’s about time you came home, young lady.” Wow. From the moment I stepped foot on the land, I simply had the feeling that I really was “home.” It is very difficult to describe to anyone else. It’s almost as if I could feel the past envelope me, and felt not just that I’d come home, I fell into a state of peacefulness over the next day or two that I had never experienced before. I felt a real sense of belonging. I would soon learn that many of my ancestors had walked and worked this land. They lived, laughed, loved, danced, bore and lost children, and both struggled and thrived right here on this land, in this home (or very nearby). And I was about to step back in time. After all the introductions, we went into the house and didn’t stop talking until around 1 a.m. There were no awkward moments. We just started talking and didn’t stop. Uncle James is a great storyteller and openly answered all my questions. I don’t remember now, sixteen years later, the exact chronology of events that took place during our visit, so I’ll just hit the highlights – and there are lots of them – from here on out. Here’s another picture of the homestead. Uncle James took us across the road, up on a hill the next day to capture this view. The land we are standing on was for sale at the time. I kick my self often for not buying it on the spot. Funny thing is that my husband, son and I had spent two Christmas’s in recent years at a time share near Chancellorsville, Va., and toured the Wilderness, Spotsylvania and Fredericksburg Civil War battlefields. We’d also head up to Washington, D.C. for a day to catch a Washington Redskins game. All I knew about this family at the time is that they lived somewhere near Culpeper, Virginia, and I’d never dream of just calling them out of the blue. That is exactly what I should have done. This entry was posted in Family, Genealogy, History, Virginia and tagged ancestors, ancestry, family, Genealogy, history, Virginia. Bookmark the permalink.